Ultimately, the MS650 is all about sound quality. This is a wonderful soundbar and while there are cheaper options, this is a package that delivers. Soundbars are emerging as the preferred choice for a lot of people. Compact, easy to accommodate in the home and getting better and better in performance with every generation, there are plenty of reasons to plump for a smart soundbar over a more traditional sound system. Companies like Samsung have been investing a lot into audio, resulting in a wide range of diverse speaker offerings, breaking down traditional lines and challenging those brands you might typically associate with premium audio products. The HW-MS650 slots into the centre of this new world of soundbars. It is smart, connected and stuffed full of innovation. It also sounds superb, getting Samsung off to a great start. The important thing to note about the MS650 is that it's a single box solution. There is no separate subwoofer and in many ways that's part of the appeal, as you don't have to accommodate a hunk of bass box somewhere in your room. Don't be fooled into thinking that you'll be missing out on bass as a result, however, as this soundbar is a bit smarter than that. The MS650 offers a fairly conventional rectangular design, with neatly chamfered edges to soften the corners. The front is all grille, hiding the nine drivers behind, but also housing a small display on the right-hand side. This display - which can be switched off if you don't want to see it - conveys basic information, such as the input method, but only shows three characters. On the right-hand end are button controls should you need to manually change anything, such as the input or volume if you don't have the remote to hand. There's no garish branding either, which we really like. That allows the high-quality brushed finish to shine without distraction. 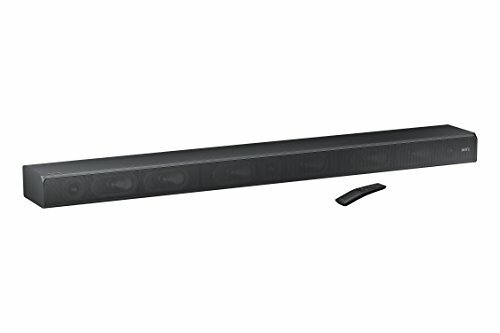 The soundbar is very much designed to be wall mounted, with mounts included in the box, as well as the option to buy a separate WMN300SB mount (£69 from Samsung) that will let you hang the soundbar off the Vesa mount on your TV. If you're also using Samsung's "no gap" wall mount, this means fewer holes in your wall and a tidy solution overall. It's the MS650's connectivity that offers a little more than you might elsewhere, specifically when it comes to power. Not only does the soundbar have its own power cable, but you can connect your TV power cable to it too. Well, you can if you're connecting a Samsung TV and you have the optional cable to let you do this. Doing so will mean you have one less cable draped across your wall. The cable comes with the TV mount mentioned above, so you then have everything for a clean installation. More importantly there is HDMI passthrough, which naturally supports 4K HDR, as well as the conventional optical input, meaning you have a choice of how you connect your devices. HDMI passthrough means you can connect whatever the source of your content is to the soundbar directly and on to the TV. That might be your 4K set-top box (i.e., YouView or Sky Q), although in this world of many devices you're likely to have more to connect to your TV, meaning you'll have to rely on the return channel coming to your soundbar. There's support for audio return over HDMI, with Dolby Digital and DTS Digital surround decoding, or the included optical connection (cable provided) makes for an easy option with minimal setup, meaning you can simply run the audio from your TV to the soundbar and this will cater for those with older TVs too. That's not all the connectivity that the MS650 has to offer either. It also has Wi-Fi to allow an instant connection to your Samsung TV, meaning a wire-free solution if you want it, as well as conventional Bluetooth. With the set being Spotify Connect compatible and Samsung Multiroom compatible (through Wi-Fi again), that means you can simply fire the music from your phone over to play on your soundbar, with outstanding results. Call us old fashioned, but we prefer the cable connection option for traditional media content, especially when connecting to a recent Samsung TV with a One Connect box, as it's so simple to run an HDMI cable to the soundbar. There's one irritation if you do choose to connect to Wi-Fi with your soundbar: we found the MS650 would connect and disconnect from Wi-Fi, even when we were using it for HDMI audio. When it connects you get a message on the display, and the same when it disconnects again. That random and unnecessary repeat notification gets rather irritating when you're watching a movie. Let's get to the heart of the matter. Samsung is calling the MS650 soundbar a Sound+ soundbar. As we said, that means there's no separate subwoofer, aiming to deliver the bass you need along with the rest of the sound from the same unit. To help make this happen, there are nine speakers in the MS650, split between six woofers and three tweeters. These are grouped into left, right and centre, with each section getting a pair of woofers and a wide-range tweeter. That arrangement means that the soundbar can effectively widen the soundstage, giving you immersive audio from the left and right, while firing out a clear central channel to keep dialogue crisp. There are nine amplifiers driving these speakers, as well as some very clever technology that cancels bass distortion. This analyses and predicts the distortion that's likely to occur, meaning tighter control over the woofers so that it can counter distortion for crisp and precise sounding bass response. The results are fantastic. We've become accustomed running a soundbar with a pretty big subwoofer as that's the most common setup. Often, however, the woofer is a lot more powerful than you need it to be - apart from when you really want to annoy the neighbours. Samsung's solution is cleaner, meaning less to plug in and accommodate, while also sounding fantastic. Where that really manifests itself is when the bass kicks in on movie soundtracks; turn the volume up high and the MS650 isn't marred by dumb bass rumblings, it's a smarter solution with smarter results. You also don't need to crank up the volume to get the best out of the MS650. At normal listening levels you'll find a good presentation with that tight bass, clear vocals and a soundscape that'll keep that movie swimming along. For those who want to expand the system, the MS650 is also compatible with the SWA-9000S kit, which is a £249 addition that gives you two wireless rear channels. It's no Atmos experience, however, so if full Atmos surround/projection is what you're after then look to the HW-K950 Atmos soundbar. The MS650 also makes a great music system. Thanks to the simplicity of Samsung Multiroom you can very easily pick the source, make pairings with other Samsung speakers and listen to your music without your TV being in the picture, with support for a lot of services. There are several sound modes that Samsung has packed in too. These can be accessed via a Samsung TV's controls - at least on the Samsung Q7 and MU7000 that we tested it with - or via the buttons on the remote. The surround option will expand the soundstage somewhat for those more immersive effects with a noticeable left-right spread without totally sucking you in due to the lack of rear channels. Surround can be on or off, as can the Smart mode which can give a noticeable lift to some TV programme audio. However, you might just find that with a tweak of volume and bass that the Standard mode will suit you fine. You can switch modes through the included remote, but more detailed controls, including firmware updates, need that Samsung Multiroom app. The aim of Sound+ and of this Samsung soundbar is to give you great audio with no fuss. And it's mission accomplished. The MS650 is so easy to use as a single box sound solution and it performs so well that it's impossible not to recommend it. It's a clean solution with very few compromises. There's also a lot more on offer for those who want to expand the system or do more than just make Eastenders sound better. The option for a rear channel, more sophisticated mounting options, or making this part of a multiroom system all add appeal, as do the convenience of things like Spotify Connect. Ultimately, the MS650 is all about sound quality and convenience. This is a wonderful soundbar with great integrated bass performance. While there are cheaper options on the market, there's no denying this is a single-box package that delivers in abundance.